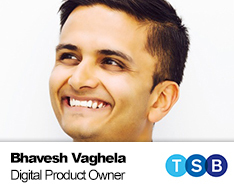 Bhavesh is an agile digital professional with 12 years experience in strategy, product leadership and digital transformation. He is skilled in managing and influencing across generation and management levels. He enjoys connecting people and ideas to inspire, innovate and co-create solutions. Bhavesh believes the future is APIs and recently lead the creation of an API ecosystem across Barclaycard focusing on user experience, technology and commercial value.